If you are interested in reading other evaluations of the Vineyard movement, many of which are more thorough, I would suggest the following books and articles. Charismatic Chaos by John MacArthur, chapter six, ‘‘What is behind the ‘Third Wave’ and where is it going?’’ Power Religion, edited by Michael Horton, part two, which has three chapters by John Armstrong, D. A. Carson and James M. Boice. Signs and Wonders and Evangelicals: A Response to the Teaching of John Wimber by John Woodhouse. Three articles that I would recommend are ‘‘An Appraisal of the Signs and Wonders Movement’’ by Ken Sarles in Bibliotheca Sacra, Jan-March 1988. ‘‘The Signs and Wonders Movement: Ministry or Manipulation’’ by Jack Brooks in Masterpiece magazine, July/August, 1991. ‘‘Testing the Wine from John Wimber’s Vineyard’’ by Tim Stafford in Christianity Today, August 8, 1986. In 1918, the late Princeton theologian B. 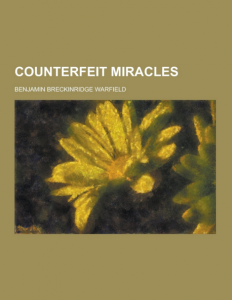 B. Warfield wrote Counterfeit Miracles in which he presented the evangelical point of view that miracles ceased with the apostles because their function was of no further use. Though not held by all (D. A. Carson objects to such a strict closure whereas MacArthur agrees) this book is still a major factor in charismatic issues and a testimony to early Presbyterian thinkers. It is printed by Banner of Truth as late as 1986.